Defrost wild blueberries in colander over bowl so any juice will strain off. In a small fry pan over medium heat, toast pine nuts. Stir occasionally to avoid burning, about 5 minutes. Transfer to plate to cool. Puree 1/2 cup wild blueberries with 1/2 cup water. In mixing bowl blend flour with salt. Add in wild blueberry puree and continue to mix until a smooth dough forms, adding more flour if needed. Divide dough into eight equal sized balls and with rolling pin, roll out into 10” circles. In a fry pan over medium heat, brown each wrap, about 1-2 minutes per side. Stack wraps, cover with aluminum foil, and allow to cool. Stir remaining wild blueberries into the goat cheese until smooth. Season with salt and pepper to taste. 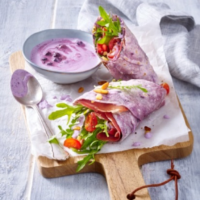 To assemble, spread a thin layer of wild blueberry goat cheese onto one half of each wrap. Arrange the ham, arugula, tomatoes and pine nuts on top. Roll up wrap, cut in half and serve with remaining wild blueberry goat cheese.